The world's largest maritime museum is packed to the gunwales with intriguing objects, fascinating galleries and hands-on exploration opportunities for children and families. Head to Royal Greenwich to find out more about seas, ships and sailing. 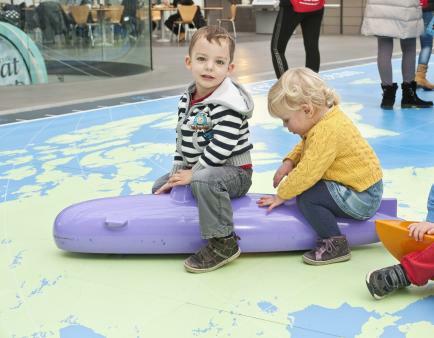 Little adventurers will be hankering after life on the ocean wave after just a couple of hours at the National Maritime Museum in London’s historic Greenwich. Dominique Dinse visited with Oliver, 10, and Ben, 9. This historic museum is part of the beautifully curated Royal Museums Greenwich stable, some of which are free including this magnificent London landmark. Opened to the public by George VI in 1937 and recently extensively renovated to make it one of the most family-friendly venues in the UK, it houses the world’s biggest collection of maritime-themed memorabilia dating back from when Britain ruled the waves to present-day feats of shipshape engineering. 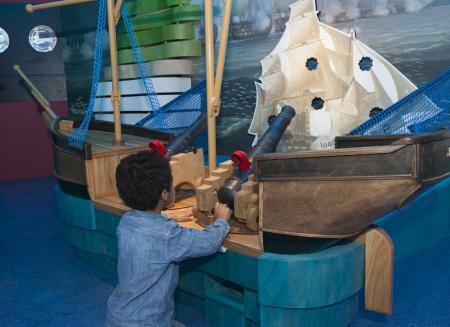 Ahoy!, the museum’s brand new children’s gallery for 0-7s, has a boatload of fun for the tiniest explorers in your crew. You can take aim at a pirate ship with a pint-sized cannon, help build your own galleon, join forces with other mini adventurers to steer miniature ships around an interactive boatyard. There are dress-up costumes everywhere in here to help you really get into character and you’ll feel like the king of the world – Titanic-style – as you clamber up on the play deck of the good ship Rawalpindi which juts out into the main entry hall so you can peer down at the landlubbers below. Teeny tots have their own safe harbour in a cosy, fenced off section for under-4s with ball pool, soft play beach and little pretend ice-cream shop, just lovely. Slightly older children will jump at the chance to take the helm in a ship’s bridge simulator to steer their passengers safely into port in a very realistic simulator. Or stoke the boiler – complete with fake coal – before bunking down below decks in the cosy kids’ cabin. There’s a miniature fishmonger’s – complete with apron, hat and cash register – where maths skills can be practised as you buy and sell all sorts of fishy favourites. This age group will also love exploring in the All Hands Gallery, up a further level on Floor Two. Shoot down a dastardly pirate ship in an interactive game, load cargo and help prepare food in the ship’s galley and find out about the strange meals sailors ate on board – tack and ship’s biscuits, anyone? Our 9- and 10-year-old pretend to be too cool for school sometimes, but they leapt at the chance to grab their own touch-screen tablet from The Dock upstairs on Floor One and take a spin around the Great Map. 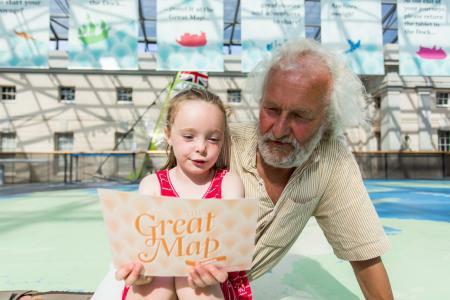 You can walk across the surface of this giant, colourful atlas that covers the entire floor beneath the vast sunlit atrium and collect treasures from all over the world in the totally immersive game The Great Explorer – they’ll learn all sorts of fascinating facts without even realising. This age group will also have the patience to explore the wealth of maritime riches kept on permanent display here in vast rooms packed to the gunwales with intriguing objects. Treasures include the jacket worn by Lord Nelson at the Battle of Trafalgar in 1805 – with the shot hole made by the fatal bullet still thrillingly visible in the shoulder. 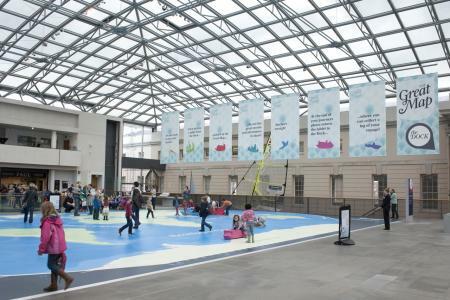 The museum's special exhibitions and interactive shows, which are fantastically family-friendly. The Maritime Museum offers regular (and brilliant) family events: Explore Saturdays (offering kids the opportunity to 'meet' a character from maritime history), Discover Sundays (hands-on craft and activity sessions) and Play Tuesdays (exploring the Museum through music, art and stories; £3 per child with one accompanying adult). Free craft activities are also on offer upstairs at the Great Map all through the half-terms and holidays. On the day we visited, children of all ages and their grown-ups were having great fun making fantastical sea creatures out of paper cups and split pins, decorating them with tissue paper and cellophane and fierce-looking eyes and tentacles. For light bites, here’s a café selling hot and cold drinks, ice creams and cakes. If you’re wanting to make your visit a bit more special – for Nan or Grandad’s birthday, say – try a meal at The Brasserie, which offers a gorgeous menu of seasonal specials in a glass-walled room overlooking beautiful Greenwich Park. There’s a focus on fish, as you’d expect of a maritime establishment, but meat-eaters are also amply catered for. A brilliant children’s menu is £9.50 for 2 courses – crammed with kids’ favourites including sausage or fish goujons with chipd, tomato pasta or mini roast beef plus ice cream or chocolate brownie for dessert. If you'd rather picnic, simply step outside the Museum and walk into Greenwich Park. Royal Greenwich is a relatively stress-free journey with kids as everything is so well signposted. 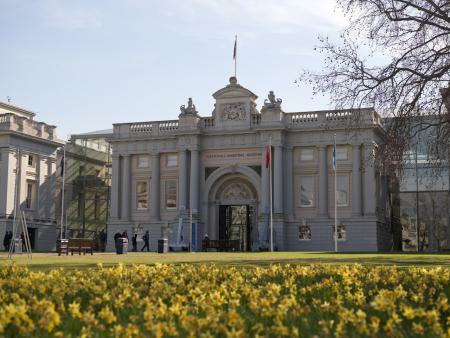 The National Maritime Museum is located in Greenwich (Zone 2), a short journey from central London with direct routes in under 20 minutes from London Bridge and Cannon Street (rail), or Bank (DLR). The nearest DLR station is Cutty Sark, only about three minutes’ walk away. The nearest overground train stations are Greenwich and Maze Hill. Admission to this national treasure is free. There are donation boxes at the entrance and useful maps with floorplans are available at the help desk for £1. The museum is open Monday-Sunday, 10.00-17.00. Because there’s so much to see at Royal Greenwich it is well worth making a day of it and combining your visit with The Cutty Sark, Royal Observatory or Queen’s House – for admission prices, visit the Royal Museums Greenwich website. The Maritime Museum wins this category hands-down, simply because it is tucked away around the corner, out of sight of the main entrance so – big cheer from hassled parents – you don’t need to exit through it! It is, though, well worth a visit, as it’s one of the biggest and best-stocked museum shops we’ve seen, with plenty of great, inexpensive souvenirs in low-level displays just inside the doorway. Favourites were tiny pirate puppets for £2.50, sweet marine-themed pencils with bright wooden sailboat toppers, bouncy ball 3D fish and inflatable beach balls – all £2.50 each. Explore from afar with a rich collection of curriculum-linked resources specially designed for the classroom, including high-quality images of themed objects, films and learning activities. The Maritime Museum also offers a great collection of free interactive games to play online, including ocean quizzes, a Tudor exploration mission, sailing skills and more.